In a unanimous vote of 30 to 0, the Missouri State Senate passed Resolution 28 on May 18, calling on the Chinese Communist Party to end the practice of forced organ harvesting. Falun Gong, also known as Falun Dafa, is a Chinese spiritual practice that grew in popularity during the 1990s. According to official estimates, before the Chinese regime launched a nationwide persecution against adherents of the practice in 1999, between 70-100 million people were practicing Falun Gong. Jiang Zemin, the Communist Party leader at the time, perceived the peaceful practice as a ideological threat to Communist rule, and mobilized the state’s security apparatus to harass, arrest, and detain practitioners in an effort to eradicate Falun Gong. In the past decade, independent researchers have uncovered evidence of an even darker crime. The Missouri resolution cited an investigative report published in 2016 by David Matas, human rights attorney; David Kilgour, former Canadian Secretary of State for the Asia-Pacific region; and Ethan Gutmann, an investigative journalist, that concluded China had established an “industrial-scale, state-directed organ transplantation system, controlled through national policies and funding”—whereby organs are forcibly harvested from prisoners of conscience, most of whom are Falun Gong adherents. 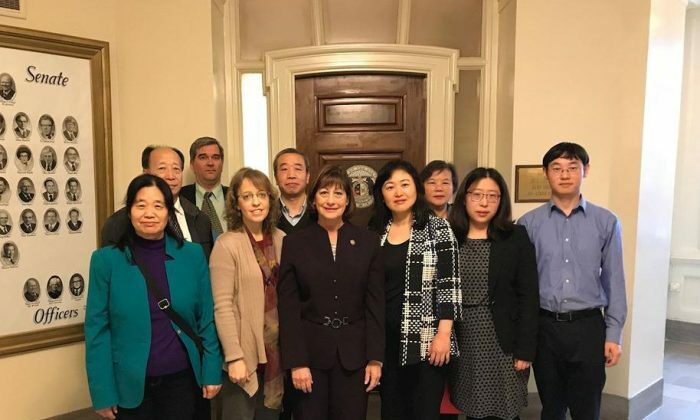 “Here in the state of Missouri, we cannot stand for these human rights violations,” said Senator Schupp, according to a report by Minghui.org, a U.S.-based website dedicated to reporting on the persecution of Falun Gong in China. “I’m proud to stand with you, and say to the People’s Republic of China: Do not continue to persecute these [Falun Gong] practitioners. It is not okay to kill people in order to harvest their organs, even when Missourians need an organ transplant,” Senator Schupp said. This is not the first the Missouri state government has expressed concerns about organ harvesting in China. Last year, the state’s House of Representatives passed a similar resolution, Resolution 7, which was sponsored by Rep. Lynn Morris (R), condemning crimes of organ harvesting in China. U.S. Congress also joined in its censure for organ harvesting in China by passing the H.Res.343 in June 2016. Rep. Ileana Ros-Lehtinen (R-Fla.), who introduced the Resolution, said China’s record of human rights violations are well known. “It is the horrific treatment of the Falun Gong practitioners, that is particularly egregious, yet does not receive the attention that it deserves,” she said.